Hey Amber…”powerful” women can cope with reality! 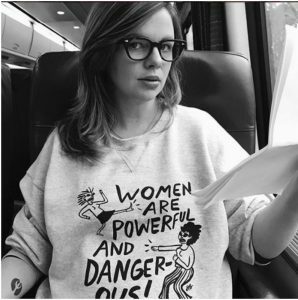 From Fox News: Amber Tamblyn shared her grim-sounding story from the 2016 presidential election as well as the impact the aftermath had on her as an expectant mother. The star revealed that she had brief thoughts of having to give her child away to Canada or Sweden in the wake of Donald Trump’s election. The 35-year-old actress, who got her start on the soap opera “General Hospital,” spoke at Vulture Fest’s “Feminist AF” reading series where she shared an essay about her experience at the Javits Center with fellow celebrities Amy Schumer and America Ferrera at what would have been Hillary Clinton’s victory announcement. “I swigged some more Zantac, and my baby shoved her foot into my ribs, as if to foreshadow the paint that was yet to come,” Tamblyn said (via The Hollywood Reporter). She went on to describe in her essay the moment that Clinton’s director of strategic communications informed attendees that she would not be speaking that night. “A dark realization swallowed me: I was going to bring a baby into this world. And not just any baby: a girl,” she said, revealing that’s when she had the thought about having to give her daughter away to Canadians or Swedes to save her from whatever perceived horrors she saw upcoming in Donald Trump’s presidency. Later in the essay, she described collapsing on the subway station stairs the following day after experiencing shortness of breath. It turned out that she was just having a panic attack. Fortunately, the “Sisterhood of the Traveling Pants” actress gave birth to her daughter Marlow with her husband, “Arrested Development” actor David Cross. They shared images of the newborn in March of 2017. “Somehow my wife gave birth to a 55-year-old furrier from Crown Heights. I’m investigating,” Cross wrote on Instagram at the time. This Trump Derangement Syndrome adversely affects director Joss Whedon, who is one angry dude. The “self-proclaimed feminist” called Ivanka Trump a dog. And he also demeaned a group of teenage cancer survivors to take a shot at republicans. Poor Joss must have been feeling really blue on Saturday. He tweeted out the above with the hashtag #MadamPresident. You better buckle up buttercup…ya’ got three and a half (or maybe more) years of Trump presidency. Better pick up some sticky buns!